icCube’s team would first like to thank you for being our loyal customer for many years now. The new Reporting version 6 was released end last year and has continuously been improved ever since, giving more flexibility for creating reports and user-friendliness was amazingly enhanced compared to former icCube Reporting versions. 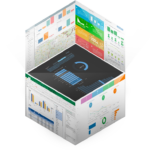 To the customers who didn’t migrate yet, we would therefore like to propose you a special offer on this year’s end that will allow you a smooth transition to icCube’s Reporting version 6. Contact us if you like to receive more information.